David Welter was sworn in as State Representative of Illinois’ 75th District on July 15, 2016. Prior to his appointment to the Illinois General Assembly, Representative Welter served as Chairman of the Grundy County Board where he was first elected in 2010. At the time of his appointment David served as Human Resources & Procurement Manager for a local trucking and construction equipment company in addition to his role as Board Chairman. He will now bring his valuable private sector experience and knowledge of local government to the Illinois General Assembly. 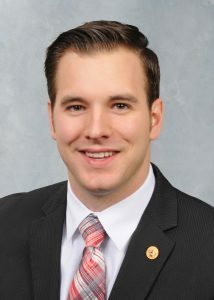 Representative Welter and his wife, Ashley, reside in Morris with their two young children. As Grundy County Board Chairman, we cut taxes, balanced our budget, and lived within our means – all lessons that Springfield can learn from. As State Representative, I will bring that experience to the Capitol and work with my colleagues on both sides of the aisle to restore growth and opportunity to our economy; make state government more efficient and accountable; and once again make Illinois a place where everyone can be proud to live, work and raise a family. I believe in local control of schools by parents and locally-elected school boards. A one-size-fits-all model dictated by state and federal bureaucrats does not serve the best interests of students here in Grundy, Kendall, LaSalle and Will Counties. I will fight against unfunded mandates on our schools and work to give parents and local school boards more control over education here in our community. The Second Amendment is one of the most important rights guaranteed by the Bill of Rights. The operative text states that the right of the people to keep and bear arms…shall not be infringed. In spite of the clarity of this amendment, we have seen repeated, consistent, and sustained attacks on this right and efforts across the spectrum to infringe on this individual right. The founders intended the Second Amendment to function as a citizen check against overreach in the event that the government started to take away civil rights guaranteed in the Constitution. I will not support unconstitutional gun restriction laws. I will actively fight any attempt to undermine our Constitution and infringe upon the Second Amendment rights of law-abiding citizens. I believe in the sanctity of life and the inherent dignity of every human being. For me, being pro-life includes strong support for the Illinois Safe Haven law, the conscience rights of health care workers, and adoption services that give unwanted and abandoned babies the chance to grow up in a loving home.